City Board of Elections officials have lost track of more than 1,450 pieces of equipment, including some voting machines, according to an audit released Monday. "If you can't count inventory, how can New Yorkers trust you to count their votes?" said Comptroller Scott Stringer, who led an army of auditors carrying out the task. 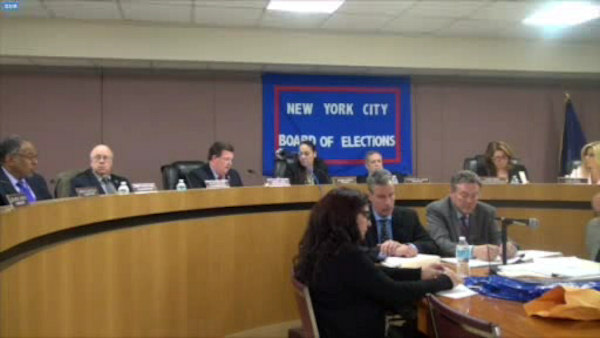 They examined Board of Elections inventories over nearly three years, ending last February. Tracing more than 5,000 items out of about 11,000 inventoried, they scoured five board warehouses and other facilities to match the entries. They found hundreds of pieces of election and office equipment that were missing from inventory records, but actually existed. They included four voting machines, 45 computers, 127 monitors, 85 printers and a dozen TV sets. That means the items might sit unused as preparations are made for the voting. In addition, auditors discovered more than 1,170 items that had not been properly tagged: 463 computers, 449 monitors, 23 laptops and 232 printers. A Board of Elections spokeswoman declined to comment. Stringer said such disarray raises alarms that property could be stolen without anyone noticing. The even bigger concern, he said, is a lack of control over equipment bough with taxpayer money can result in voting irregularities. The audit was initiated before the state's April primary, when more than 100,000 Brooklyn voters had trouble casting their ballots. "Just as the Board of Elections may have let thousands of voters slip through the cracks in the most recent election, they've bungled the job when it comes to keeping track of their electronic election and office equipment," Stringer said. The comptroller made a series of recommendations to the board: Maintain complete and accurate records, in real time, with an annual review of major electronic equipment, then tag all the property.